Today, I decided to find a good spot to grind the gazillion pieces of leather I’d need to max out my Leatherworking. I found the spot pretty quickly as it happens, and I’ll be sharing the secret with you very soon. What I didn’t bargain on was something very special indeed. It reminded me of how much I enjoy this game and how, even when you think you can’t be surprised, you end up being just that. 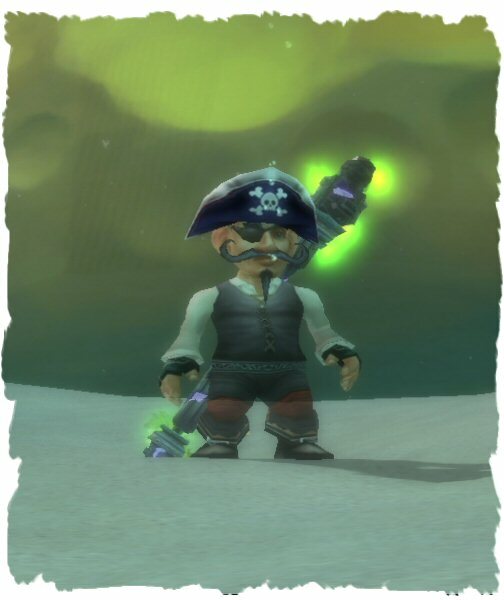 Now THAT’S a Proper Pirate Costume! Eyepatch? Check! Beard? CHECK! Ability not to lose the costume whilst flying or in fact doing anything? CHECK!!! 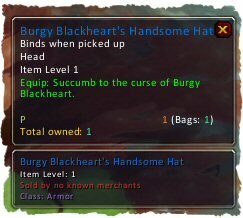 I don’t mind that there’s no achievement to kill all the Rares this time in Cataclysm, if the plan is to make awesome one-off items like this and leave them on mobs then I am SO off to go and track as many rares as I can down to see what they’re going to drop. Considering this was a complete surprise I find myself thinking this is one of the most awesome drops I’ve had for quite some time. 24/7 PermaGhostGnome Costume ftw!!! Nice one! Gratz on the hat/costume/makeover/thingy, looks awesome!